The WBA has ordered Shannon Briggs v. Fres Oquendo for the WBA regular title. Fight should take place before the end of Feb. Such a cluster**** in the heavyweight division right now... Not the worst thing tho, lots of good fighters. Pacquiao's camp demanding $20MM minimum to fight Terrence Crawford. LOL Crawford will obliterate him. It'll be really ugly. Oquendo hasn't been relevant since 2007. They are lining up a meal for Briggs. I really wanted to see him and Browne fight. That could've been fight of the year had they showed it on PBC. JOSEPH PARKER will now be co-promoted by Bob Arum’s Top Rank as the unbeaten New Zealander prepares to fight Andy Ruiz for the vacant WBO world heavyweight title this weekend. Arum will work alongside Duco Events, Parker’s main promoters, to build the fighter’s profile in America and China. The news ensures that Arum – who promotes Ruiz – will have a world heavyweight champion after this weekend, regardless of who wins. “Listen, having been in this business 50-plus years, I don’t expect anybody to win a fight, particularly when it’s as close on paper as this one is,” he said. “I really think that the winner of this fight probably has the best chance to be the preeminent heavyweight, I really believe that. The winner of the fight will have 90 days to fight mandatory challenger Hughie Fury. I watched that Parker vs Ruiz fight. Did you see it? Who did you think should have won? I thought it was really close all the way, would hate to be the judge having to make a call. Could have gone either way IMO. I wouldn't overreact from this sub-par showing from Parker tho, as he fights bigger opponents(size and ranking) his jab will be much more effective. Ruiz did a great job keeping him out of rythym, but I wouldn't say he exposed the blueprint of how to beat Parker or anything like it, was more of a formation of just how quick and slippery he is - Ruiz style is rather impossible for most Heavy's to emulate..
2; 10 - 9 --- Parker loses this rd but you can see he finds something with the Jab about halfway thru. It's the first thing Ruiz' corner addresses when he sits down. 3; 10-9 --- Parker is again finding the jab but there's just way too much activity and clean punching from Ruiz, he's finishing these rds too strong. 4; 9-10 --- Ruiz walked him down the entire rd and landed the harder blows but threw very few combo's he could've easily won the rd, it was a confident rd. gave it to Parker on the strength of his activity. 5; 10-9 --- Most of Parker's punches were whiffed or deflected. Low activity rd for both fighters. Ruiz is making Parker uncomfortable. 6; 9 - 10 --- This is the fight Parker should've been fighting in rd 1. Somethings changed, he's got more pep in his step and it's like he's finally found the range on the outside for the Jab. ruiz does have 2 nice flurries in this round including his best punch of the fight thus far a clean right hook to the nose -- Parker has some type of chin, he ate 4 consecutive hooks at one point. 7; 9 - 10 --- Parker wins this rd decisively. I've gotta think Ruiz conditioning is doing him a great disservice right about now..
8; 9 - 10 --- Parker wins decisively. He took away a lot of Ruiz's gameplan in this rd other than a few counter punches. 9; 9 - 10 --- Parker's cruising. He must've known Ruiz would wear out. 10; 10 - 9 --- Decisive rd for Ruiz. He gets back to a lot of what was working/ Fairly disappointing rd for Parker, gotta be more active nd land more blows. 11; 10 - 9 --- Parker looks gassed andis just trying to clinch over and over and over. Ruiz wins thsi rd on activity and pressing the action. 12; 9 - 10 --- Parker unloads some devastating right hands on him in this rd. Exactly how I would have scored it round by round as well. But yeah good info thanks man. Excited to see Parker's next fight. Any idea who it would be and when? Also do you know what happened Tyson Fury? Why wasn't he defending his belt? The heavyweight picture will be much clearer in a few months. Parker might be best off waiting for a big name, many are taken. Maybe he'll do a tuneup, I'm sure if anyone decent wants to fight in NZ he'll take them on.. Would love to see him fight Deontay Wilder but he's already got a fight at the end of February with Andrzej Wawrzyk. Tyson Fury is a cokehead and failed his drug tests. I'm glad he did, because now Anthony Joshua's got a chance to unify some belts much quicker... Also Klitcschko's a big name for Joshua to use as a stepping stone..
Looks like Kell Brook vs. Errol Spence in the UK sometime in May!!! Chocolatito vs Sor Rungvisai will be the co-main to GGG-Jacobs at MSG!!!! Might splurge for good seats... Must-see card. Is that a Thai fighter? Sounded like a Thai name. Yup. Srisaket Sor Rungvisai, he's got no chance. Chocolatito(#1 P4P) is truly brilliant, he's the greatest Nicaraguan fighter ever.. The fact that they're both 5'3" is a bad sign for Rungvisai, Ideally you'd want a reach advantage. Chocolatito is more of a natural 112lber this fight is at 115 though. OXON HILL, MD - The VASYL LOMACHENKO - JASON "El Canito" SOSA junior lightweight world championship event has become an embarrassment of Ukrainian riches with the addition of two title fights. Undefeated World Boxing Organization (WBO) cruiserweight world champion and Olympic gold medalist OLEKSANDR USYK and NABF light heavyweight champion and Olympic bronze medalist OLEKSANDR GVOZDYK will be defending their titles against MIKE HUNTER and YUNIESKYI GONZALEZ, respectively, in all-action co-main event battles, Saturday, April 8, at The Theater at MGM National Harbor in Oxon Hill, MD. 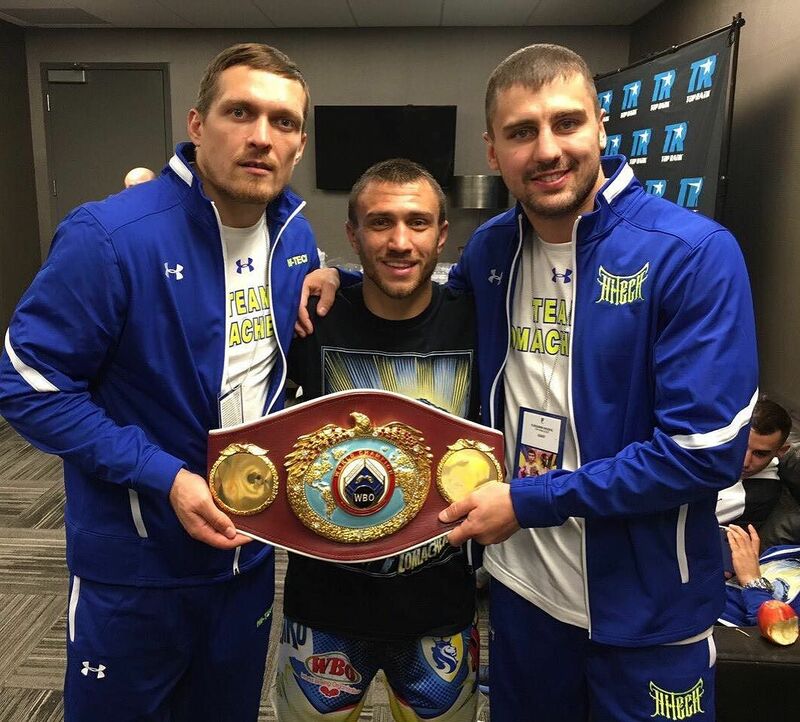 The Lomachenko, Usyk and Gvozdyk championship Ukrainian tripleheader will be televised live on HBO World Championship Boxing, beginning at 10:00 p.m. ET/PT. The six televised championship fighters boast a combined record of 80-4-4 (62 KOs), good for a winning percentage of 91% with over 3/4 of those victories coming by way of knockout. Promoted by Top Rank®, in association with Peltz Boxing Promotions, K2 Promotions, K2 Promotions Ukraine and Joe DeGuardia's Star Boxing, remaining tickets for the Lomachenko-Sosa world championship event are priced at $153, $128, $103, $78 and $53, including all applicable service charges and taxes. They can be purchased online at mgmnationalharbor.com or ticketmaster.com. For more tour and ticket information, visit mgmnationalharbor.com or call (844) 346-4664. “I’m excited for this fight because I asked for it. If I don’t knock him out, I’ll be surprised," said Hunter. "I'm happy to know the name of my next opponent. He is a strong fighter and a new challenge for me," said Gvozdyk. "Thanks to Top Rank and HBO to making this happen. "Top Rank is very proud to present these two compelling co-main event championship fights featuring Oleksandr Usyk, with K2 Promotions, and Oleksandr Gvozdyk," said Hall of Fame promoter Bob Arum. "In a historic first, HBO World Championship Boxing will present three title fights, featuring three Ukrainian champions defending their titles, and within eyesight of the Nation's Capital." “I’m very happy and thankful to K2 Promotions and Top Rank along with HBO to be able to present Lomachenko, Usyk and Gvozdyk on one special night,” said Egis Klimas, manager of Usyk. "So happy and thankful to our promoter Top Rank and HBO for bringing Gvozdyk back in the ring on April 8th," added Klimas, who also manages Gvozdyk. "In his last fight, on HBO Pay-Per-View when he fought Isaac Chilemba, Gvozdyk proved he was a quality fighter who belongs on TV battling the best fighters in the light heavyweight division. Gonzalez is a good fighter, fans will see good show and Gvozdyk will be able to show everyone his world-class skills." ”I am looking forward to April 8 and this exciting HBO show," said Joe DeGuardia, promoter for Gonzalez. "Yuniesky Gonzalez once again will be stepping into the ring with a world class and very dangerous light heavyweight in Gvozdvk. However, Yuniesky is one tough, fan-friendly fighter and, with his new trainer Pedro Diaz, he is a very confident. Yuniesky will be appearing for the third time on the HBO network and you can be sure that everyone will be in for one heck of a fight”. Usyk (11-0, 10 KOs), from Kiev, Ukraine, and a 2012 Olympic gold medalist, captured the WBO cruiserweight world title in his 10th professional bout, a division record for winning a world title in the fewest fights. Usyk dethroned Krzysztof Glowacki via unanimous decision on September 17, 2016, ending the undefeated defending champion's two-year reign. In his last fight, on December 17, Usky made his U.S. and HBO debut, successfully defending his title by knocking out world-rated contender Thabiso Mchunu in the ninth round. Considered the class of the division, Usyk trains in Oxnard, Calif. under the tutelage of Anatoly Lomachenko, father/trainer of Vasyl Lomachenko. Gvozdyk (12-0, 10 KOs), from Kharkiv, Ukraine, enters this fight having won 10 of his last 12 fights by knockout, including all three of his NABF light heavyweight title fights. A bronze medalist at the 2012 Olympics, Gvozdyk captured the vacant NABF title with a second-round knockout of Nadjib Mohammedi on April 9, 2016. He successfully defended that title twice last year scoring a sixth-round TKO of Thomas Karpency on June 23 and an eighth-round stoppage of Izek Chilemba on November 19. He enters this fight world-rated No. 6 by the WBO and the World Boxing Council (WBC), and, No. 7 by the International Boxing Federation (IBF). Gonzalez (18-2, 14 KOs), a native of Pinar del Rio, Cuba, who lives and trains in Miami, Fla. with Pedro Diaz, has collected his last nine victories by way of knockout. His only blemishes are a very disputed decision loss to former WBC light heavyweight champion Jean Pascal and a majority decision loss to Vyacheslav Shabransky in 2015. Last year Gonzalez won both his fights by stoppage. The non-televised undercard will feature undefeated No. 1 super middleweight contender JESSE "Hard Work" HART from Philadelphia, PA., and local favorites from the metro Washington, D.C. area, including undefeated prospects MIKE "Yes Indeed" REED and PATRICK HARRIS in separate bouts. Full details on the undercard will be announced at a later date. American Heavyweight champ Deontay "The Bronze Bomber" Wilder (37-0-0 36ko's)returns to the ring vs Gerald Washington on Fox.. now! Prediction on the fight? Winner, rounds? Glad I didn't stay in to watch Thurman-Garcia.. Just caught thereplay now, that was a robbery. Thurman clearly won and it was called a draw. No way. I thought for sure Thurman had it. I changed the channel before the decision figuring it was a sure thing that Thurman won. The "losing formula" for a new-age boxing robbery is to win a majority(or all) of the early rounds and split the late ones..
Danny "The Miracle Man" Jacobs (32-1-0 29ko's) vs Gennady "Triple G" Golovkin (36-0-0 33ko's) tonight at the Garden!! Jacobs loss was in 2010... This is one of the best fighters who's got some sort of chance to past the Golovkin test. It's unlikely tho because Golovkin just deals so much damage.. Jacobs has power.. Golovkin has a wicked chin.. we'll see.. If Golovkin wins this his case for #1 PFP improves in my book. The International Boxing Federation has confirmed that light heavyweight contender Artur Beterbiev (11-0, 11 KOs) is about to become the mandatory challenger to IBF world champion Andre Ward (31-0, 15 KOs). BoxingScene.com reported on Tuesday that Beterbiev was about to get the mandatory position, by default, because of the boxer's tough task in securing an opponent for a final eliminator. The six top-ranked contenders, including Beterbiev, have until March 23 at 5 pm to agree to take part in the IBF's final eliminator. The other boxers include Sergey Kovalev, Erik Skoglund, Enrico Kölling, Dominic Bösel and Robert Stieglitz.